Bishkek is not a typical tourist city. Most people will spend some time here to arrange travel onwards through Kyrgyzstan, but it is not a place they seek out for its tourist attractions. Yet, the city has more to offer than one would think at first glance. We certainly had a lot of fun during the days we spent here. Ala-Too Square is located in the middle of the city. While there isn’t much to do in the square itself, the fountains are very refreshing on a hot day. Usually, I wouldn’t jump into a public fountain. But after seeing locals splash around in them, we took off our shoes and walked through the water ourselves. At one end of the square, you will find the National History Museum. It was closed when we got there and judging by the broken windows, it didn’t look like it was going to reopen any time soon. 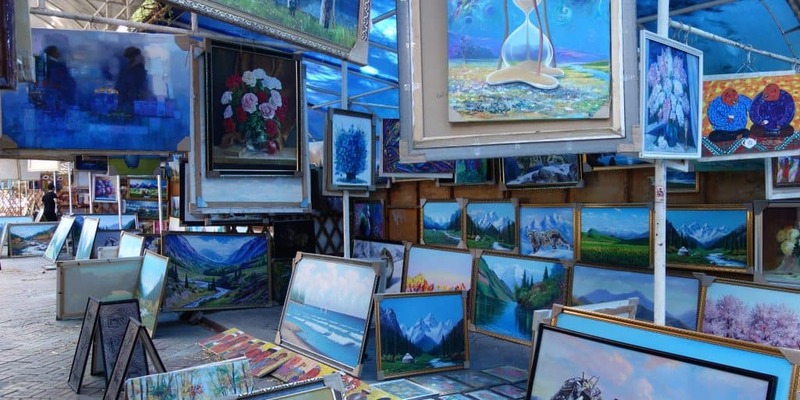 Osh Bazaar is the biggest bazaar in Bishkek and the most photogenic one I went to in Central Asia. As everywhere in this region, you can find everything you could possibly wish for at this bazaar. 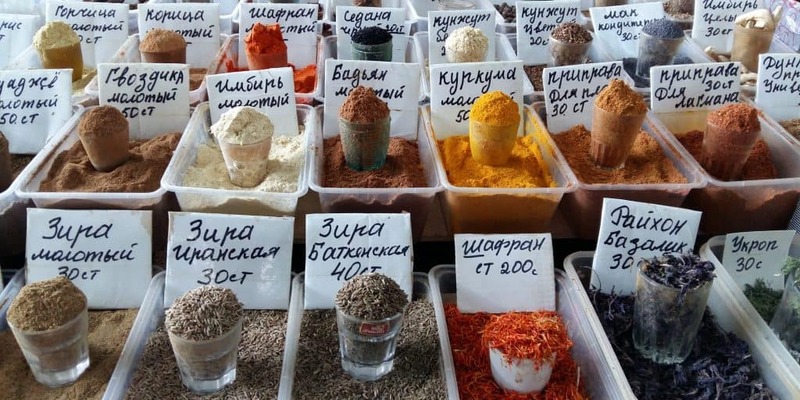 From shoes to spices and tea, you can buy it here. It is easy to get lost amidst the wares and photo opportunities and spend an hour or two here. 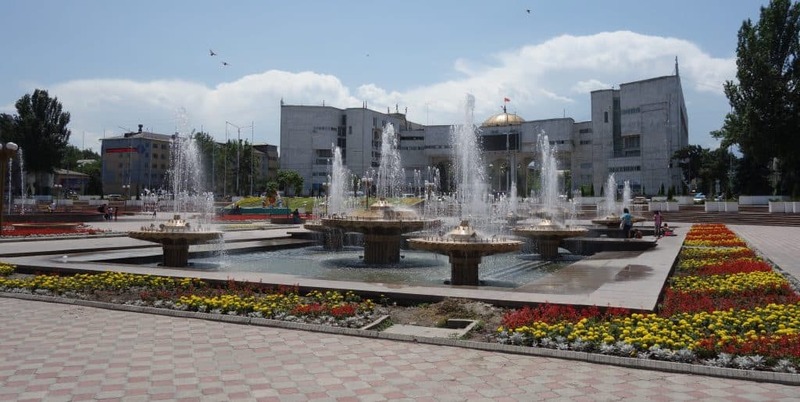 Bishkek is a green city with lots of parks, statues and fountains. As the History Museum, that we had originally planned on visiting, was closed, we spent the afternoon exploring the parks and taking pictures of each other while doing funny poses in front of the statues. The parks are where you want to go for a walk, get ice cream and watch locals. At the end of Erkindik Avenue, one of Bishkek’s largest streets, you will find Oak Park. Come here to see artists exhibit and sell their paintings. Most will have local themes, many will be over the top, but you can find some real gems in here. And who knows, maybe you will find one that you would like to take home. Bishkek has quite a few cafes. My favourite was, without doubt, Sierra Coffee. Run by a kiwi, it has amazing ice cream sundaes on offer. While there are cheaper places in the city, and I still don’t know what New Zealand lemonade is, it is a nice place to hang out and relax. The wifi is good, too. There are more great cafes in Bishkek, of course. Just go for a walk around the city and you will find them. With an abundance of restaurants, what better place could you find to try Kyrgyz food? A traditional dish, as everywhere along the Silk Road, is Plov, a rice dish with vegetables and meat. Another dish to try, more typical to only this region, is Beshbarmak. 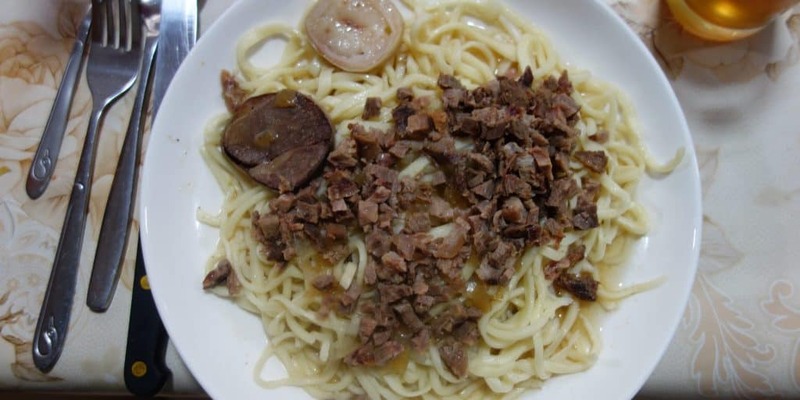 It is made of horse meat that has been boiled in its own broth for a couple of hours and is then sprinkled on top of thin noodles. If you prefer dumplings, try Manty. They are steamed dumplings filled with meat and onions. A recommendation for a typical Kyrgyz drink is Kymyz. It is fermented horse milk and is a slightly alcoholic, fizzy drink. A similar, non-alcoholic version is maksym, which consists of fermented grains. It is an acquired taste but I highly recommend you at least try it. Ala-Archa is the closest national park to the city and makes for an easy day trip. You can catch a taxi in the morning, go for a hike and then return to Bishkek in the evening. If you want to expand your trek, there is also the option of staying overnight in a hut before hiking back to the park entrance the next day. The mountain scenery is stunningly beautiful. 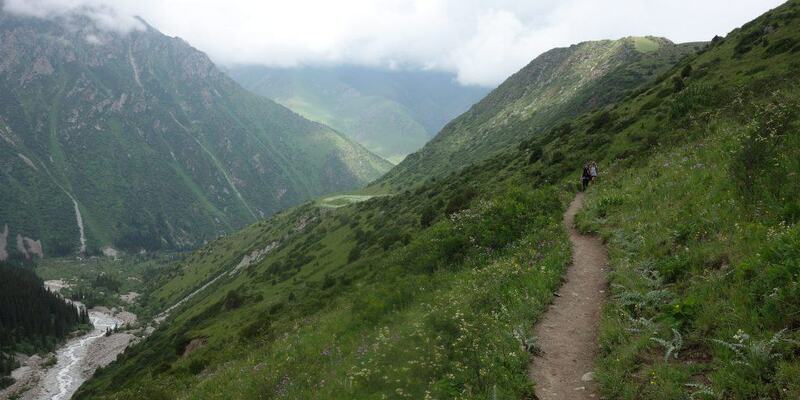 In June, wildflowers are blossoming everywhere, giving you a taste of the colourful Kyrgyz alpine meadows. You will pass a couple of lookout points along the way and if you keep going, you will reach a waterfall. Remember to bring enough food for the day and warm clothes, as the weather can change very suddenly. 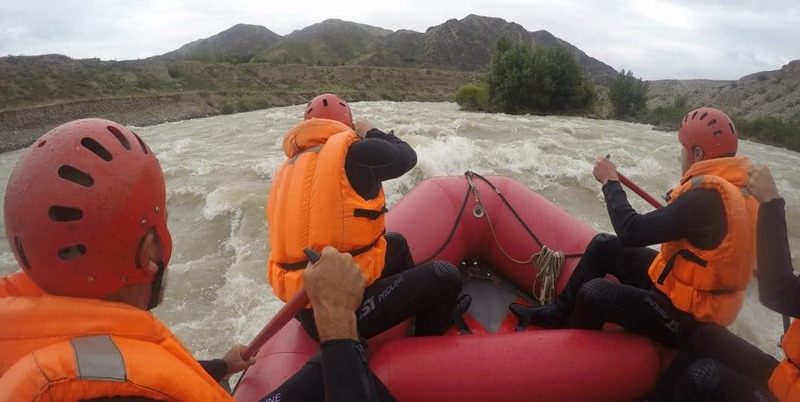 If you want to leave Bishkek on a day trip, rafting is another option. We went with the Silk Road Water Centre and our hostel helped us organising both the transport to the river and the rafting itself. While the Chui River is nothing like the Nile, the Zambezi or the Colorado River, we had a lot of fun that day. Our guides took us down a couple of rapids that left us soaking wet. None of us fell in, but if you prefer, they also have an option for stronger waves. So what do you think? Have I convinced you that Bishkek is more than a transit city?